Home > Projects > Projects - FAQs > How Do I Set up Recurring Tasks? For example, if you have to send out a Weekly Status Report at the end of the week for a month, you can create a recurring task that repeats every 7 days, for a total of 4 recurrences. The first recurrence will be created on the date marked as the Start Date. The next instance will be generated 7 days after that date and so on. To create a new recurring task, open the Task Edit popup and navigate to the last tab. Repeat Every: Choose how often the task should be created. You can choose between x number of days or months, for e.g. to setup a weekly recurrence, choose 7 days. Start Date: Choose the date the first recurring task should be created on. It must be today or a date in the future. Number of Repeats: Set the number of times you would like the task to be repeated, or check the “Never Expires” box. Due Date Offset: This allows you to specify what the due date for this new task will be. If you enter 5, the due date will be set to 5 days after the task is created. If left blank, no Due Date will be set. Check that the default time at which the task will be created is correct. 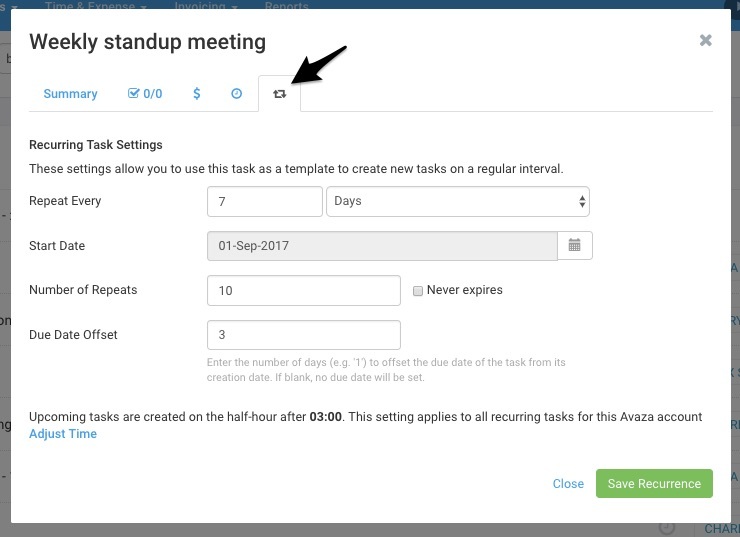 By default we use 10:00 am in your account’s time zone, but Admin Users can change this account-wide setting from the recurring task pop-up. 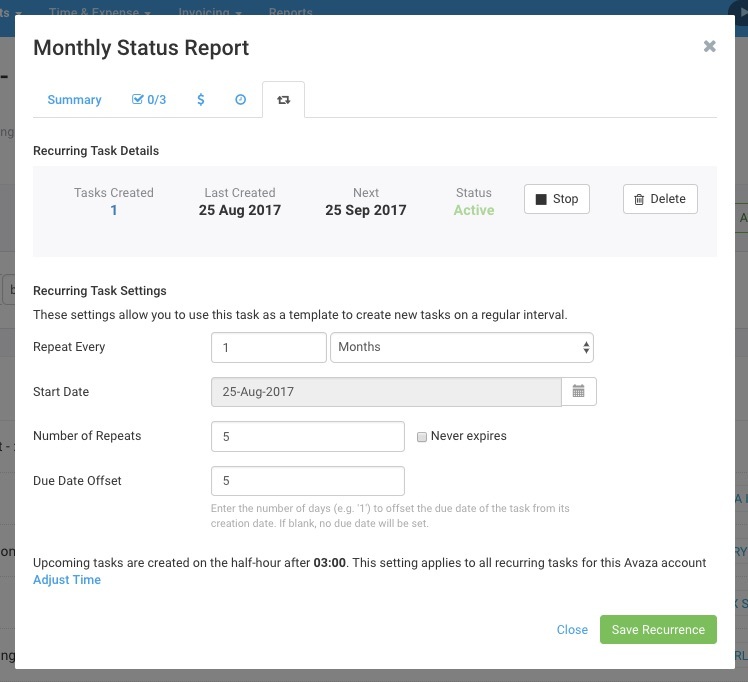 When viewing Recurring Tasks, you can quickly identify the parent Recurring Task, and its status by looking at the task icons.